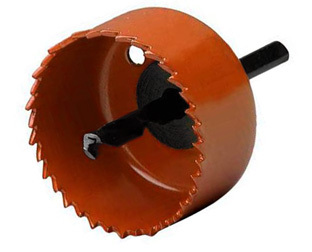 A hole saw, sometimes called a holesaw, is a tool used to cut precise holes through materials. Hole saws generally consist of a central drill bit which is used to drill the guide hole in the centre of the hole which is to be cut. For this reason the central drill bit sticks out slightly further than the rest of the hole saw. The hole saw is attached to this central drill bit usually by a collar which screws down from the top of the drill shaft to securely clamp the hole saw down. Hole saws come in a wide variety of sizes which can be swapped onto the central drill bit to create holes of different diameter.